Scuba Diving in Bali is a combination of slow and strong currents; caves, steep walls, wrecks; and high biodiversity. Bali is a dive destination for both beginners and experts to enjoy. This Indonesian island is known for its people’s distinct Hindu heritage, elaborately ornamented and perfectly choreographed spiritual dance ceremonies. You might find you love Bali so much because there are radically different worlds to explore each day. It certainly is a great dive destination and one that you will want to return to time and time again. Along with the famous Balinese dive sites, a spectacular assortment of resorts and exotic activities is what makes Bali more than a little like heaven in the Pacific. When is the best time of year to Scuba dive in Bali? The Balinese climate is comfortable all year round, but The best Bali scuba diving season runs from May to September. This is when the water temperature nearly matches the outside temperature and almost always hovers between 27 and 29 degrees Centigrade. And the visibility tends to be the best. When you travel to Bali in this time, you can make the most of your dives. Divers who wish to avoid crowds might consider diving in the low season of October through April or choose to hang around more advanced scuba dive sites surrounding Bali. Dive schedules in Bali vary because strong currents sometimes sweep the coasts of the islands, and dive operators in Bali plan around the activity of these currents. Some of the waters that make up the island currents are cold, so temperatures at some dive sites (only in the stronger current areas) can hit a pretty chilly 15 degrees centigrade. The US Liberty World War II Wreck – This 120m-long ship found its resting place among diving fame and black volcanic sands near northeastern Bali, and it makes for great night dives. Read more about the The US Liberty on our blog. Gili Tepekong – An experienced-diver-only attraction, this is a steep-sided small island featuring a super-deep canyon dive with strong currents and visible volcanic rock boulders. Menjangan Island – A favorite for novice divers. This location is more a collection of dive sites, but it offers nearly everything – an eel garden, a 19th-century shipwreck, and even a cave! 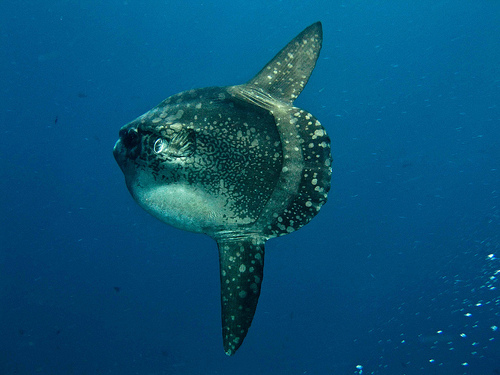 Nusa Penida – An island to the southeast of Bali, this dive site is unique because it is well-known for providing sightings of the huge Ocean Sunfish. Read more about the Nusa Penida on our blog. Nusa Dua – While this area is thought to have relatively low visibility and high boat traffic, this is the perfect spot for beginners, since the water is extraordinarily calm and so many diving agencies are nearby. How to travel to Bali? Ngurah Rai International Airport is your only gateway into Bali unless you decide to book a private flight. But you are in luck because Ngurah Rai connects Bali to major cities like Amsterdam, Los Angeles, London, Osaka, and Rome by most of the major airlines. This list is certainly not comprehensive. Airlines to Bali never list “Bali” as one of their destinations. Instead, you will have to touchdown in Denpasar, Bali’s provincial capital, so search for this city name when booking your flight. Ngurah Rai offers plenty of ways for you to make it off the tarmac and into the various cities, towns, coasts, and most importantly, dive sites of Bali. Day trips in Bali are especially easy to take because of the island’s small size (90km from North to South and 140 from East to West). As a general rule, you can make it from any point on the island to any other point within an hour by taxi. Accommodations in Bali are best found on the Eastern and South-Eastern shores. Article written by Rutger Thole who is an avid scuba diver and loves to travel, dive and write about scuba diving. Based in Amsterdam he runs bookyourdive.com and at least twice a year he plans a dive trip of the beaten track.